It’s a Tuesday when I meet Abu Sauda. This is a busy day in the centre of Babile in Northern Ghana. The bustling market town nestles on the border of Burkina Faso and hundreds of locals come from all over the district to trade a huge variety of goods at the market. Abu Sauda aged 29, lives in a nearby village. She is a married mother of four young children aged 1, 4, 9 and 11. She arrives early to get the best spot on the edge of the town, bringing her youngest child with her, as well as carrying her goods on her head in a large metal pan. Abu runs a business buying and selling groundnuts (peanuts), which is a staple ingredient in the area. Groundnuts are used in many traditional dishes and are also ground into an oil. Abu has found if she positions herself on the outskirts of the town she can buy and sell at a much better profit than she would selling in the market. It is a strategy that has paid off and her business is thriving, but it wasn’t always like this. She takes some time out to tell me her story, she is softly spoken and her chubby one-year old daughter chews on a pink pen I have given her. In the hope of increasing their income her husband gave up farming and became a bus driver. But this meant he was away a lot, leaving Abu at home with the children. 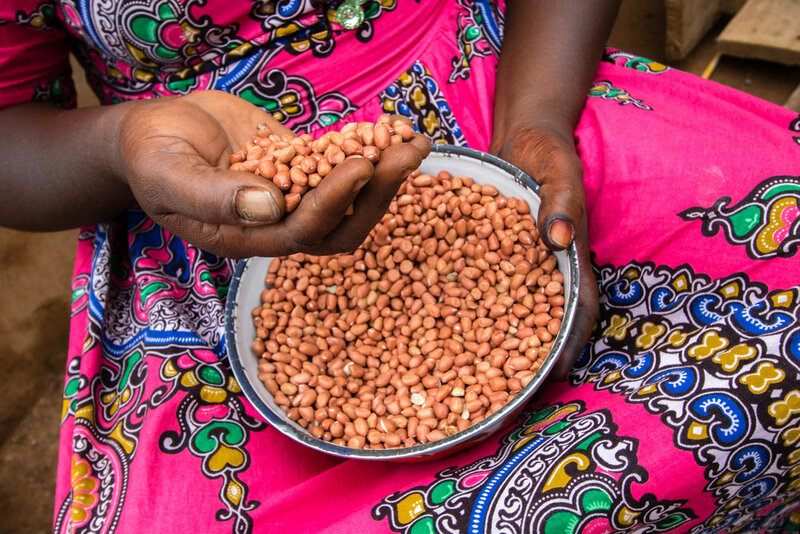 Trying to escape the situation she was caught in Abu started to buy and sell groundnuts as a small business, but without any capital to invest, she struggled to expand and take advantage of demand in the local community. She heard through the local rural bank Bessfa that she might be eligible for a Deki loan so she got together with four friends and they all applied. Abu was accepted for her first loan of £260 in May 2015 and shortly afterwards received business training from Bessfa on how best to invest the money. Abu bought several huge sacks of groundnuts, which she broke down into smaller quantities which people could afford and she could sell at a profit. She did well and, supported by her friends, she quickly repaid the loan. Abu has clearly flourished from the opportunity given to her. She beams with satisfaction when she tells me ‘Before I could not even buy myself any clothing or personal items, feeding the children was always a problem. Now they have regular meals and the older ones are back in school. I have claimed back the respect of my family. My husband even helps with the childcare now’, she laughs. In the future she hopes to apply for another loan to expand her business further, and buy stock in larger quantities. Her goal is simple ‘I want my children to have cushioning to get further in life. I don’t want my girls to struggle like me’. Every single Deki loan you make is life changing. And remember, it truly is a loan, so when you get a repayment you can lend again to help yet more communities to grow and prosper.